With winter approaching I am trying to hold on to the warmer weather for just a little longer, so decided to try to incorporate butterflies into my latest card creation. I think of butterflies very much as a summer visiter, flitting around the garden and stopping to rest in the sunshine, so I wanted to add them to a card. I put Crumb Cake cardstock on to a card blank (I have some I am trying to use up), then matted with Very Vanilla, onto which I stamped the En Francaise background stamp in Crumb Cake. 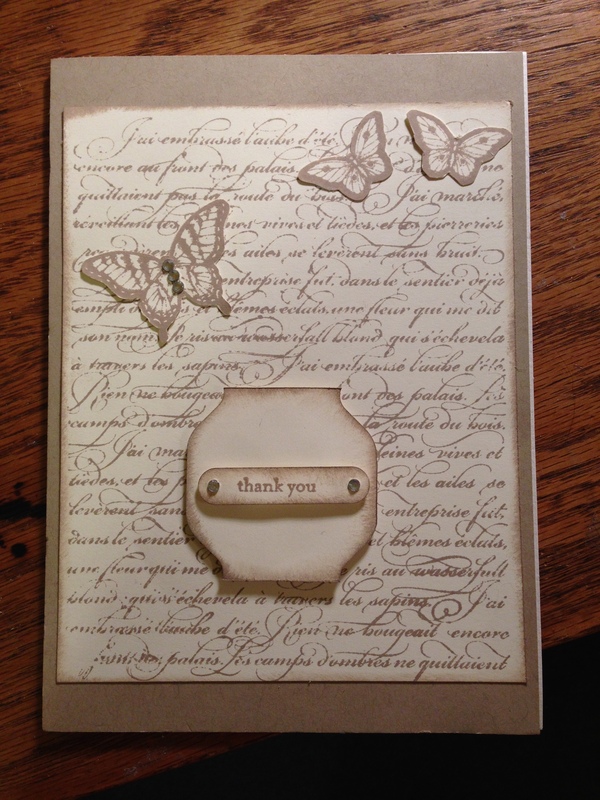 I stamped two small and one of the larger butterflies from the Papillon Potpourri set on to card scraps and then cut out a garden jar shape and stamped a sentiment. For a little bling, I have decorated the body of the largest butterfly with small rhinestone, and put a couple more on the sentiment. Et voila! Teeny Tiny Sentiments Stamp Set. Hi! I’ve been following your weblog for some time now and finally got the bravery to go ahead and give you a shout out from Atascocita Tx! Just wanted to mention keep up the fantastic job!